Kazan is the capital city of the Republic of Tatarstan, Russia and lies at the confluence of the Volga and Kazanka Rivers in European Russia. The population of the city is 1 143 600. It was founded in 1005. Kazan hosts Tatarstan President's residence and administration (in Kremlin), Tatarstan's Cabinet of Ministers and Council of State (on Freedom square). In April 2009, the Russian Patent Office granted Kazan the right to brand itself as the "Third Capital" of Russia. In 2009 it was chosen as the "sports capital of Russia". Kazan has a humid continental climate with long cold winters and warm, often hot dry summers. The region is situated on the way of movement of the western damp air masses. Moving from Atlantic ocean, they soften a local climate for the considerable extend. Penetration of cold air occurs from the Arctic basin, and warm air comes from the southwest in winter and from the southeast in summer. Snow precipitation is moderate, reaching its maximum height in February and March - 38 centimetres. The number of clear, cloudy and dull days in the year are 40, 169 and 149 properly. The most cloudy month is November, the least are July and August. Sometimes there is a fog in autumn and in spring, 16 days in all. Prolonged heat broke records in temperature in July and then in August 2010: on 1 August the temperature reached +39,0 °C in the shade. Minimum record was set on 21 January 1942 (-46,8 °C). The average annual wind welocity is 3,6 metres per second, air humidity is 75%. The most number of atmospheric precipitations fall from June to October. Kazan is one of the biggest economic, political, scientific, cultural and sport centers of Russia and a leading city of the Volga economic region. 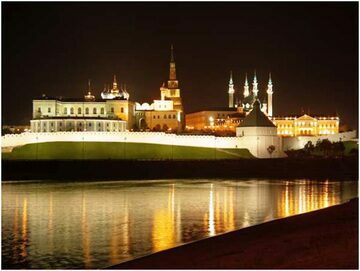 The Kazan Kremlin, which was declared the World Heritage Site in 2000, and a thousand-year history make Kazan one of the most attended cities by tourists in Russia. There are 44 universities there. The largest universities are Kazan State University and Kazan State Technical University named after A. N. Tupolev.